Jennifer opened by stating that it’s inevitable that, as a project leader, there will come a time when you must deliver bad news. It’s not easy or pleasant, but there are ways to do so gracefully and with respect for all involved. The most important question you can ask yourself to figure out the best course when delivering bad news is how would you like to hear about bad news? This change in perspective will guide you to a more compassionate end or at least help you see the situation in a different context. Then there is the more practical question of what the legal and HR policies are concerning the news. There might be restrictions around privacy or other regulations that you must be aware of so as not to make a bad matter worse. 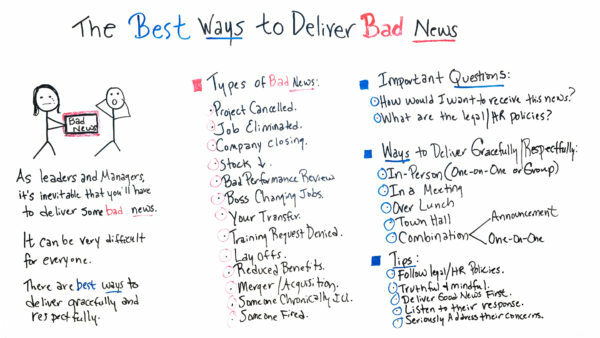 Jennifer had these tips on best practices on delivering bad news. In person is always best, such as one-on-one, or if there’s a group, then to the group the bad news impacts. The worst thing you could do is text or email, which hits hard and doesn’t permit an opportunity for you to answer questions and the person or group to process. There are many ways you can deliver the news, such as in a meeting if there is a group or even over lunch to help soften the blow with a more communal sharing of food. A town hall setting is good to field questions or even a combination of an announcement and then one-on-one for those who need a more personal approach. Finally, Jennifer ended the video with a few tips to help guide you through the difficult process of delivering bad news. Always know and follow the legal and HR policies of the organization. As noted above, being ignorant or trying to cut corners on such regulations will always come back to you and make the bad situation worse. Be truthful and mindful as you deliver the bad news. People don’t like being lied to and have a good sense of when someone is laying it on thick or sugarcoating the truth. It’s like pulling off a Band-Aid in one stroke rather than timidly taking your time. It’s worse to prolong the bad news. If there’s any good news embedded in the bad, then it’s best to deliver that first. It can help to show that you value their work. Listen to their responses. It’s part of the process of digesting the bad news. They might be confrontational or even angry but never take the bait and respond in kind. Listen and let them vent if they must; strive to be a better listener. Then seriously address their concerns. Listening is only the first part. Show that you’ve heard them by taking their comments seriously and letting the know the answers, whether those answers are good or just more bad news. They might not like it, but they’ll respect your honesty if you’re kind. Pro-Tip: Being able to deliver bad news in a way that is graceful and respectful, as Jennifer said, is one pillar that holds up good management. There are other qualities that make a good manager, such as being able to resolve conflicts and manage your time. Take it Further: Sometimes the bad news is just criticism. Learn how to get the most out of constructive criticism. Today we’re talking about the best ways to deliver bad news. Unfortunately, as leaders and managers, it’s inevitable at some point you’re going to have to deliver some bad news. And it can be very difficult for everyone. Sometimes I feel like it’s almost as bad for the person delivering the bad news. And the good news is there are best ways to deliver the bad news gracefully and respectfully. So before we talk about those ways, I want to stop and talk about some of the types of bad news because in today’s times, we can get so transactional, we don’t think about things like what if we’re announcing a company layoff or maybe I’ve seen people being announced in a group that they are no longer part of the project, they’ve been dismissed. So, that’s not really good. So, let’s think about some of the types of bad news. Number one, the project could be cancelled, a job could be eliminated, a company could be closing, the stock price could go down, which could be impacting someone’s retirement, a bad performance review, the boss may be changing jobs, which could be bad news for some people, a person’s transfer, transfer into a different group and maybe they’re not aware of that, a training request could be denied, layoffs, maybe reduced benefits, a merger or acquisition, maybe someone in the group could be critically ill, or maybe even someone in the group could be fired. So, here are two important questions, I think, I like to ask is number one, how would I want to receive this news? If I can think about that, maybe it helps me in how I deliver it to someone else. And what are the legal and HR policies that need to be followed? Here are some ways that this news can be delivered gracefully and respectfully. Number one, you’ve got to consider what the scenario is, and then determine is it best to deliver that news in person, maybe even one on one. If it’s related to maybe a project or team, maybe it’s announced as the group. It also could maybe be done in a meeting, again if it’s related to maybe a project or a team or the organization, it could be done in a meeting, or it could be done over lunch. Maybe somewhere private where you could discuss things. It could be a town hall. Again, maybe it’s a merger or acquisition where you’re announcing something. And it could be at combination of different ones. For instance, depending upon the bad news is, there may be an announcement, and then there may be some one on ones. So, you can discuss how that impacts that specific person. So, here are some tips. So again, follow the legal and HR policies, and then deliver that news truthfully and mindfully. People have a BS radar, so it’s hard to give people BS. They’re going to know that. Also, deliver the good news first, well, assuming there is good news. But, if there is good news, then layer that first and just let people know that they’re valued and respected. And then, listen to their response. Let them…hear what they have to say and give them an opportunity to voice how they’re feeling about that. So, these are some of the concerns we want to be able to address with people. But, if you need some additional resources on how you can deliver bad news, then sign up for our software now at ProjectManager.com.